Whether you are looking to buy, sell or work with a short sale in San Diego County, I am your certified realtor. 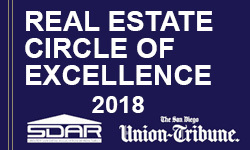 I am a 5x San Diego 5 star realtor that has recorded selling over 250 houses in San Diego County. I have over 35 years of real-estate experience that is second to none. I am a CAR SFR Specialist (Short Sale & Foreclosure Resource Agent) as well as CDPE Certified agent. I specialize with North County San Diego clients, but enjoy working throughout the entire San Diego Community. Let me work for you! Use our home estimator to find the price of your San Diego Real Estate today. Simply input your name, address and contact info for a free quote.